The main source of light is the glowing hand of God. An unnamed man in the hand of God. 01) (This page) Isaiah 41v8-10 – The Helper of Israel – Hand of God. 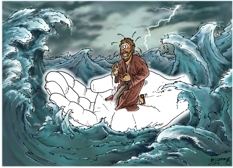 02) (Next page) Isaiah 41v8-10 – The Helper of Israel – Hand of God (Text version). The second version has 59 words or phrases included in the picture, and the background colours are muted, so that the words show up a little more clearly. The idea is that the person is in a terrible sea storm, and probably fearful of his life. What he doesn’t realise is that, in fact, he is held in the hand of God and protected from the storm – he will literally be lifted out of danger by God’s mighty, righteous right hand. 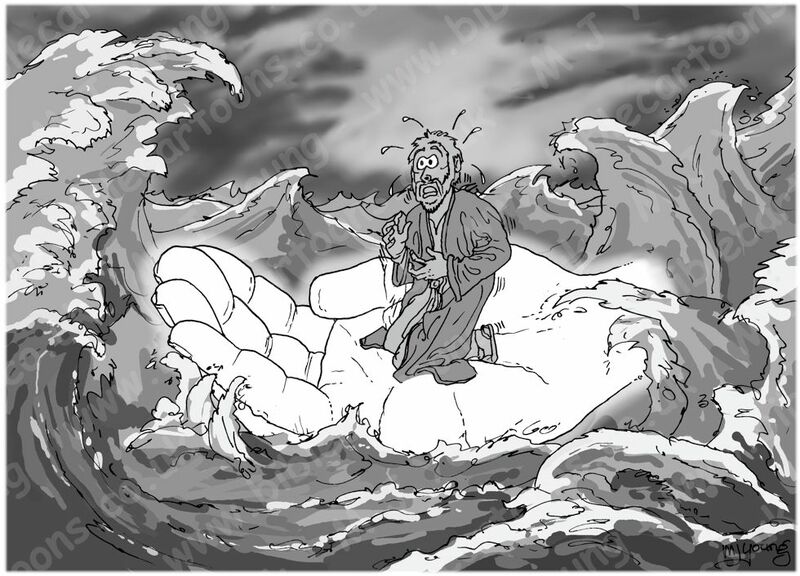 Greyscale sketch of sea storm, and man in God’s hand. 10 In his [God’s] hand is the life of every creature and the breath of all mankind. 23 For the Lord your God dried up the Jordan before you until you had crossed over. The Lord your God did to the Jordan just what he had done to the Red Sea when he dried it up before us until we had crossed over.